And really, it’s only fitting that I can make a post to her today, as I *wish-wish-WISH* I could be near her for BIG-TIME hugs as she celebrates not only another birthday… but some really great news from her doctor regarding the healthy TWINS she has now carried through a full first trimester! She and her hubs have been trying for over 3 years to become pregnant, and they’ve lost a precious angel along the way. Just when they would’ve given up all hope, they learned God had blessed them with a little Christmas miracle. A few days later, they learned it was indeed TWO MIRACLES! Which brings me back to her cookies from last year. 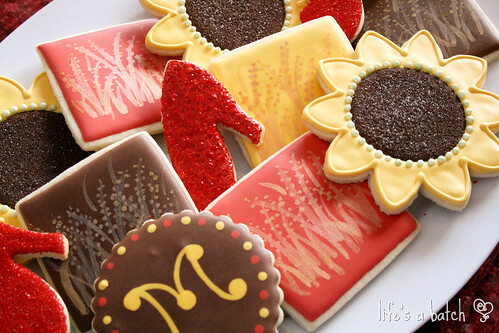 You see, Mary & her husband were leaving the military in a few months, and for her birthday, she wanted to have cookies that represented her beloved Kansas. She gave me free reign, so I went with a few Kansas staples: ruby red “Wizard of Oz” slippers, golden waves of wheat, and of course, sunflowers! I think these wheat cookies might have been my very favorite! 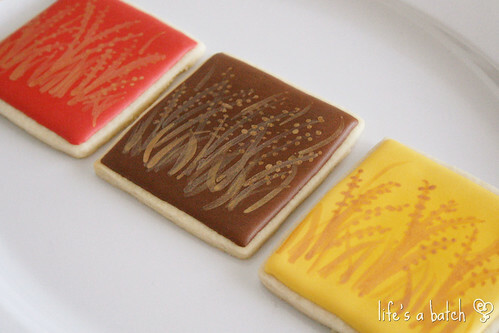 I flooded in shades of farm red, chocolate brown & sunflower yellow, and then I used a bit of gold lustre dust mixed with vodka to paint on the shimmery, waving wheat stalks. It was easy-peasy, but the end result was SO pretty! 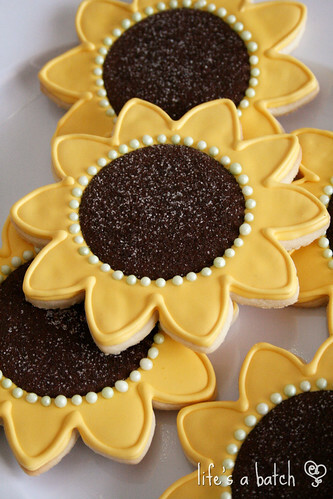 For the pale green decoration around the center of the sunflowers, I used Wilton Sugar Pearls, dropping each one carefully by tweezers into place. They add the perfect touch! I made a few simple, red-sugared ruby slipper cookies, and I was done. 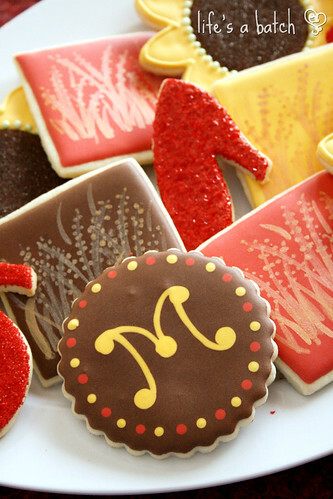 Once the designs were thrown together, it made a very sweet Kansas-esque platter for my dear Mary. « Groundhogs: Cupcake Cutter Collaboration! Ohhh, the amber waves of grain are awesome! Thanks, Jill! They were my favorite, too! 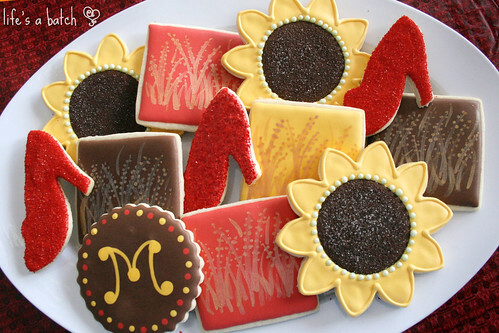 So pretty, I can’t decide which one I like more – the amber waves of grain or the ruby red slippers! Thank you! The red slippers are definitely the easiest (and the best at hiding icing errors! 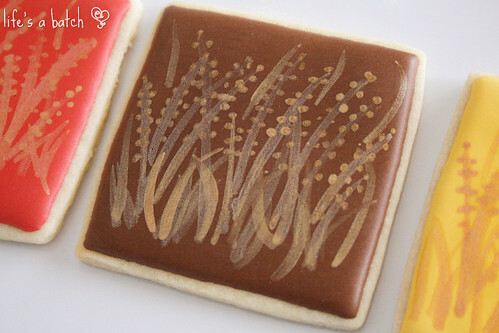 ), but the wheat cookies are my fave. Very pretty!! And how exciting for them!! Congrats to them!! Thank you! And yes, sooooooo very excited for my Mary! I love this set. The colors are gorgeous & those sunflowers are perfect. Thanks, Melissa! I’m glad you like ‘em. Aww! Congratulations to Mary and her husband. How exciting for them to be doubly blessed. Your cookies for her are wonderful. 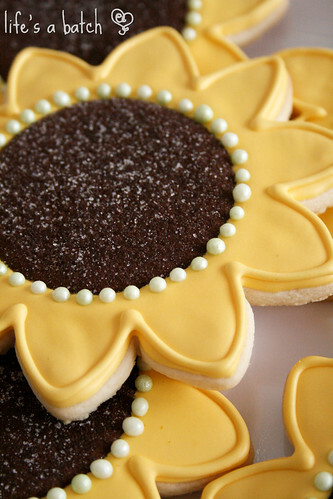 The amber waves of grain are beautiful and I love how the sunflower centers sparkle with the sugar. Thank you, Paula! I cannot WAIT to find out if she’s having boys, girls, or a boy & a girl! I’m just so ecstatic for her!